We work long hours here to provide a good service to our customers and we are always very grateful to learn that our efforts are appreciated. Here are just a few of the testimonials we have received recently. I am so thrilled with the information you have found for me. I know you did a lot of work and I cannot tell you enough how much this means to me. Thank you for all the great information about my ancestors. It is very rewarding to move forward and find new information about my family. This is an awesome service and I hope to be able to use it again. Thank you for tracing my family. I think your researcher did a top notch job. Thank you so very much. This report is beautiful and so full of information and I am so very pleased with the work you have done. THIS IS FABULOUS!! I can not thank you enough for this painstaking work and I appreciate your enthusiasm for my family. I am thrilled at the amount of information that has been researched and the findings!! I'm very excited at the information that was found and thank everyone who did the research! This has been a big puzzle for so long and at last have some answers. This greatly exceeding my expectations. I couldn't be more pleased with the results. I am so thankful for all your findings, so much more than I had even hoped for. Thank you so much for this information - the results are staggering and so amazing. Thanks so much for all the information. It is thrilling to read. I am so excited that you have found this information. I want to thank you so much for the excellent work! I look forward to doing more business with you! Thank you so much for the wonderful research! I'll use your group again in the future. You all do a fantastic job !! Your prices are reasonable and the results are quick and accurate. I couldn't be happier ! What an amazing report - so much in so little time! I was thrilled to receive this information. This a THANK YOU for helping me I could not be any happier than if I found thousands of dollars. I am sure I would never had found this info without all your help. I am beyond thrilled with this latest report. Your research consultant is awesome and so very thorough in the research and in describing the steps and locations of the search. Well, YOU found it! I am very gratified and excited to find a link at long last. Thank you both very much. I have attempted to trace this line for some 25 yrs. now, and had just about given up. The information you have provided me with is most valuable beyond what you anyone could imagine. Thank you so much, This has been a positive experience for me and i will not hesitate to recommend you to others. I am absolutely overwhelmed. I have always maintained that one gets what one pays for and always go to the professional in his/her field. You folks can do more in three hours than I could do in three months - absolutely incredible. Words can never express the gratitude I feel toward Ancestor Seekers for finding information about my ancestor. My father, who barely knew this grandfather, was here when I received your email. The pleased and incredulous look on his face was punctuated by his repeating, "wow, wow!" as he read the message. I appreciate your help and hope to work again with your organization. Thank you so much I am thrilled more than I can say. WOW!, this was definitely above my expectation. I am just totally amazed and truly excited. Thank you so very much. Just a short note to Thank you all who have worked on my family history. The results were outstanding and I am so very much impressed and pleased. I can appreciate all of the work that has been put forward. Once again, "THANK YOU ALL". When I get to Salt Lake I will be honored to shake your hand. I am really excited about your great results. You have indeed answered many of my questions. Thank you sincerely for all your fine work. It is really worth the money. Again, thank you and please thank the researcher for their hard work. I will continue to recommend your service to my fellow searchers. You will undoubtedly hear from me again when I'm ready to take down another wall. Thank you so much for your thorough report. I would certainly use your services in the future. Thank you very much for your excellent research, communications, and response time. If you ever need a reference, I will be happy to provide one. I have been working on genealogy for about ten years, and have a smattering knowledge of German, but it is quite clear to me that, on my own, I would never have located even 5-10% of the information that you have developed. 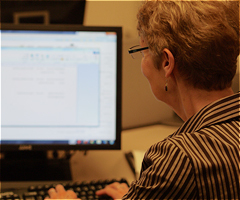 Let us know the information you are seeking and we will email you a research plan and quote. Why Not Do The Research Yourself? Come to Salt Lake City and let our professional genealogists help you conduct the research yourself.